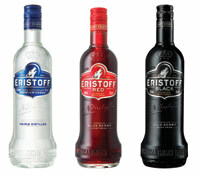 ERISTOFF Vodka, one of the fastest-growing vodka brands in the world, has been launched in South Africa. ERISTOFF forms part of the global Bacardi brand portfolio, which also includes Bacardi Superior, Bombay Sapphire, Grey Goose and Martini. The ERISTOFF brand is renowned internationally, says Bacardi South Africa. It is currently one of the top ten vodka brands in the world and is the number one vodka in Austria, Portugal, Belgium, Chile and the Dominican Republic. It has also received many international accolades for its quality and taste. ERISTOFF is a premium vodka, originally created by Prince Eristoff in 1806 in Georgia. It is made from 100% pure grain, triple distilled and charcoal filtered to create a clean, smooth taste that can be enjoyed neat, over ice or mixed. The ERISTOFF logo embraces the brand’s roots by featuring the silhouette of a howling wolf: Persians originally named Georgia ‘Virshan’, meaning the ‘Land of the Wolf’, as the wild and rugged landscape is the home to the iconic grey wolf. Today, the wolf remains part of Georgian culture and folklore. In keeping with its heritage, ERISTOFF Vodka’s brand promise, says Bacardi, is “an ‘Untamed Night’ for the highly sociable, spontaneous, vibrant and confident individual”. Drinking suggestions: ERISTOFF Original can be drunk with any mixer or energy drink, ERISTOFF Black (Wild Berry) is perfect as a shooter or with lemonade and ERISTOFF Red (Sloe Berry), a great shooter or a treat when mixed with an energy drink. ERISTOFF Vodka is now available nationwide at selected retailers for the RRP of R129.00 per bottle.